To stay current on all the events and happenings that are ARTzona related, please visit our New Home on the web at: www.artzonausa.com! 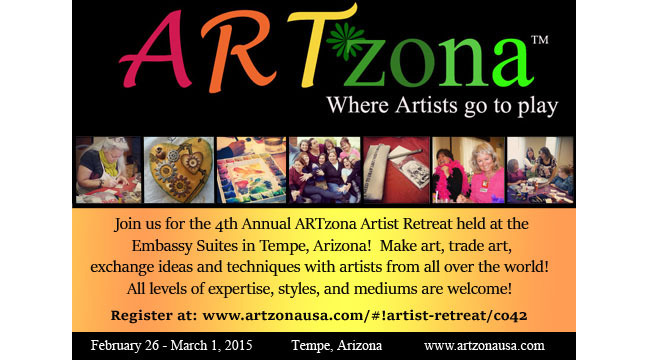 Our website has all the latest and greatest information you will ever want or need to know about the upcoming Artist Retreat in Feburary, 2015. About upcoming classes for adults and children of all ages, and our new blog format that is tied directly to the website. So come visit and bookmark http://www.artzonausa.com to stay connected. With so many artists arriving on Thursday I wanted to reiterate the Thursday evening plans. If you are planning to join us for the Thursday hike at Usery Park, please plan to meet in the lobby of the Hyatt at 4:30 pm. Note that this is earlier than 6 pm which was the original tentative time. We will likely be at the park until sunset, at which time we will head to dinner and then to Scottsdale for the art walk that runs from 7-9 pm. If you would like to meet up for dinner, we can always return to the Hyatt before heading to dinner to collect more people, then head to Scottsdale from there. Or if you have your own dinner plans, but still want to meet up with us for the art walk, then plan to meet at the horse statue on 5th avenue at 7 o’clock. Looking forward to the fun! See you in a few days! ARTzona 10 Day Forecast is for AWESOME!!! Hello fellow enthusiastic artists! No doubt you’re all getting as excited as I am for next weeks event! If you are anything like me you’re scrambling to decide what to bring and can barely sleep because your thinking of all the fun you will be having by this time next week. For those of you traveling from far and wide, I thought you would like to know that the forecast is for sunshine and temperatures in the mid 70’s for the next week or more! In other words, it will be absolutely LOVELY for your stay in Mesa, Arizona this time around! So be sure to bring your sunscreen, bathing suit, and flip flops! Still a good idea to bring a sweater, as the evenings and early mornings will still be chilly and only in the 40’s. Also want to remind you that the Hyatt has revamped their entire swimming pool area! They now have a 12 person Jacuzzi, surround sound with a big screen TV and plenty of lounge seating for sun bathing. So when you need little break, be sure to hit the pool area and soak up some vitamin D while you’re here. See you all this time next week! Wishing you all a happy, successful, creative 2014! I’m so looking forward to what 2014 has to offer for ARTzona and my family! I know that 2014 is going to start out wonderful, because in 24 days (23 for the early birds) I get to see all 40 of you amazing artists!! My New Years Resolution ~ to have my signature cards made and ready by January 23rd! It’s Official – ARTzona is Trademarked! Yes indeed – you read it here first! ARTzona is now a Trademarked Name!! The application process to be a registered trademark has begun! But for now, we get the cute little TM next to our LOGO. However soon, when the application process is complete, we’ll have this next to our name! In the meantime, this is what it looks like! That’s right my friends – We are moving on up in the world!